A Savory & Delicious Treat from Cookies & Cups Blogger Shelly Jaronsky! 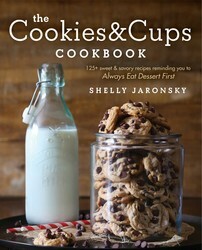 Don’t let the title of her just-released cookbook deceive you–blogger Shelly Jaronsky, author of THE COOKIES & CUPS COOKBOOK and the founding voice behind www.cookiesandcups.com, is just as savvy at whipping up delicious savory bites as she is at creating delectable sweet treats! Today we’re featuring Shelly’s savory side with this recipe for French Onion Soup Grilled Cheese. Y-U-M. For more recipes like this pick up Shelly’s cookbook, on sale now from Gallery Books!